Roz Purcell is a bestselling cookery author and entrepreneur. She has successfully launched a stellar media career, which includes a winning role on Come Dine with Me Ireland, a guest chef appearance on TV3's The Restaurant, and a stint as a Celebrity Bainisteoir on RTÉ. Her passion for healthy food and lifestyle has earned her thousands of followers on social media in recent years. Roz writes the popular food blog naturalbornfeeder.com where she shares her passion for food and shows how to create healthy and accessible dishes. Roz’s first cookery book, Natural Born Feeder, debuted at No. 1 in the Irish bestseller lists, and was shortlisted for a Bord Gais Energy Irish Book Award. Her approach to cooking is simple: she uses whole foods to live a whole life. Having developed a negative relationship with food that led her to make unhealthy choices, she changed her lifestyle by rediscovering her love of cooking. She has used her passion for food to develop tasty recipes that fuel the body, providing the energy and vitality needed to look and feel great. For her a healthy lifestyle isn’t about extremes, it’s about balance. Originally from Co. Tipperary, Roz now lives in Dublin. Want to eat well but feel you don't have the time? 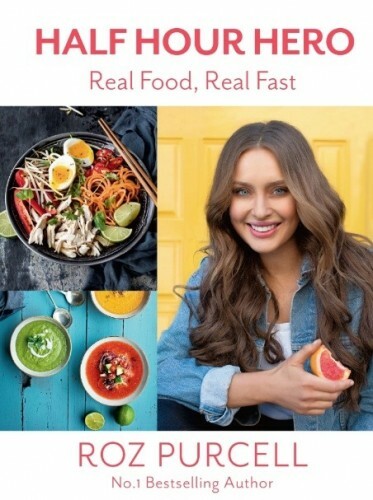 Roz Purcell will show you how tasty and healthy whole foods can be - and how easy it is to fit them into a busy lifestyle. Using readily available ingredients and store cupboard essentials, Roz's whole foods recipes are quick, simple, nutritious and most of all, delicious.